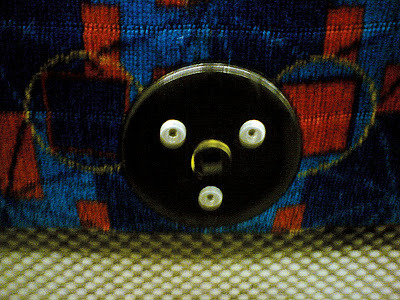 After taking the tube for years I was horrified to discover I have been being watched this whole time by robot koalas. I hope you appreciate that I missed my stop and added 20 minutes on to my journey home in order to capture this picture for you. Apologies for low quality. Mr Flange, it may be low quality resolution but that's high quality evil-robot-cute-furry animal spy hybrid spotting. Your diligence may have just saved mankind one more day in charge before the inevitable techno-apocalypse. Mint Custard salutes you.